Garden wedding ideas are the perfect choice for a spring or summer wedding. The air is warm, flowers are blooming and love is in the air. From locations to flowers to favors there are many options for this type of wedding, and our goal is to create one place where you can find all of the information you need about garden weddings. Listed below are some garden wedding ideas to get you started with your planning. There is a lot of information here, so you may want to bookmark this page so you can easily return in the future. Garden wedding ideas for locations include scenic outdoor areas such as local parks and arboretums, gazebos and bed and breakfasts that have gardens. You can have the ceremony outdoors in the garden or park, and the reception in a tent or inside a bed and breakfast or other location. Also, there are many historic sites that offer an excellent backdrop for this type wedding. Flowers can be a great choice for wedding invitations. Flowers like daisies, sunflowers and tulips make bright and colorful invitations. You should have many bright, colorful choices available to you for wedding invitations. This is the first chance you have to set the tone for your garden wedding theme. If you are having a late spring or summer wedding when it may be hot, give out colorful wooden fans to your guests that double as wedding programs. Or, match the color and design to your invitations. In addition to getting married in a church or other religious location, having your ceremony outside is a nice option. For example, have your ceremony in a beautiful garden at an Inn, park or other scenic location. A tented affair works very well with garden wedding ideas. After saying your vows in the garden, move over to the tent for an evening under the stars. If you do end up having an outside or tented reception, consider a flower carpet. Find Oriental rugs (remnants can be found at carpet stores and online) to lie under each table. Then, gather 10 bunches of assorted flowers (or however many you think you will need) and remove the stems from the petals. Scatter the petals on the ground to create a flower carpet that your guests will want to walk barefoot on. Find colorful place cards that match your wedding flowers and colors. Look for two trees that are within a few feet of each other near the reception area, tie string between them and hang the place cards on the strings with clothes pins. The sky is the limit when choosing flowers for this type of wedding. 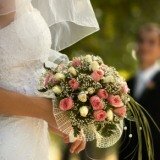 Visit our garden wedding flowers guide for some unique and colorful ideas and tips. For centerpieces, use galvanized tins filled with lemons, limes and white daisies. 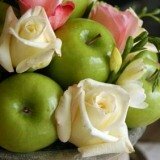 Another idea is to fill large hurricane vases with apples and cherries. Of course, floral centerpieces make an excellent choice as well. One or two primary spring flowers can be used in all aspects of your wedding. Try decorating your cake with flowers and colors that match the rest of your reception decorations, and top it off with a beautiful cake topper. If your garden wedding is outside, make sure your cake doesn't get too hot. Keep it refrigerated until it is time to cut the cake if you are getting married on a hot day. For a garden wedding, cocktail menus can work well, especially if your wedding reception is in a garden or under a tent. Try pairing your food selections with wine or a signature drink (below). You may also want to keep the menu light if you are getting married during the hot summer months. For favors, find small flower pots and plant daisies, daffodils and Hyacinth. These will add color to your reception, and they will also give your guests a nice reminder of your wedding to take home. Have your guests throw wild flower seeds at you as you leave the church or ceremony. Alternatively, give out paper cones filled with flower petals to throw at you. Visit seed packet wedding favor for more garden wedding ideas. A signature for a garden wedding could be Sangria, or a flavored martini. Arrange the martinis into a pyramid to greet the guests as they enter the reception. Fruity ice cubes are another fun idea (if you have the time). Fill ice trays with water and fruit, such as raspberries. Your guests will love your creativity, and they will enjoy their signature that much more. Find additional ideas at wedding signature drinks.